Marking the entrance to Portland Harbor, on a quarter mile dangerous rock ledge in Casco Bay. Ram Island Ledge lighthouse was not completed until 1905 due to many delays, with shipwrecks still occurring, as the ledge could only be worked on during daytime at low tide. Construction of the lighthouse itself was considered an engineering feat for the day. With its remote location some keepers found themselves stranded in their quarters inside the lighthouse during poor weather and winter storms. One Assistant Keeper Johansen and another assistant ended up spending 45 days at the lighthouse during rough winter weather. As their food supply ran low, they could only eat oatmeal three times a day to survive until they could get off the ledge to retrieve supplies. Since the lighthouse was finally built in 1905, there has not been a major shipwreck on the ledges. The best views of the lighthouse from land is from Portland Head Light inside the 41-acre Fort Williams Park, with plenty of room for hiking, picnicking, and kite flying high above the ocean shoreline in some spots. Visitors can also explore the old fort or simply go hiking along the cliff edges. The tower is not open to the public, but visitors can explore the Museum at Portland Head Light at the keeper’s house. There are many boat tours leaving the Portland waterfront where some pass by the lighthouse. Casco Bay Cruise Lines allows visitors access to some of the nearby popular islands in Casco Bay to relax and recharge, as there are over 200 islands in the region. You may find yourself renting a bike on nearby Peaks Island to explore its local artist community, hiking Long Island’s huge conservation area, or simply hiking along the quiet roads on Chebeaugue Island or Great Diamond Island, among many other islands. For those who want to learn about lobstering, Lucky Catch Cruises will haul up lobster traps for your enjoyment and passes by Portland Head Light. They also offer nature cruises, and cruises out to Fort Georges and Jewell Island, out in Casco Bay. Take Route 77 South through South Portland until you come to Shore Road on the left. You'll also see signs for Portland head Lighthouse. Follow along until you arrive at Fort Williams State Park on the left. Best views are right from Portland Head itself. The boat cruises mentioned below offer many types of cruises including specific lighthouse cruises. Many other boats may pass by Ram Island Ledge Lighthouse during charters, narrated wildlife and historic tours, fishing tours, and other types of excursions. Specific lighthouse cruises like the "Lighthouse Lover's Cruise", and "Sunset Lighthouse Cruise." They also provide a trolley tour of Portland and a lighthouse cruise on Casco Bay for Portland's lighthouses. 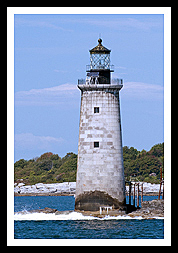 Use Bailey Island Cruise to view lighthouses on occasion. Check ahead of time.